A true departure in language learning. 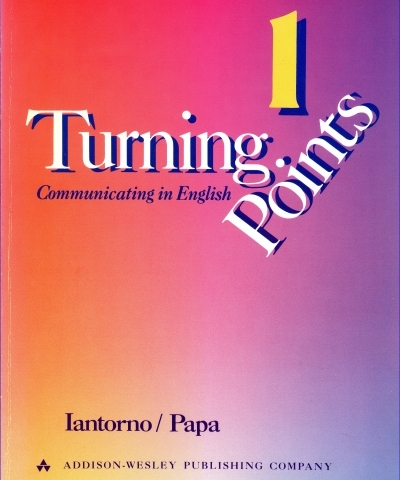 TURNING POINTS stresses the acquisition of natural, relevant language. This four-level communicative English program introduces young English learners to the social language skills needed to build the self-confidence and sense of achievement essential for success in communicating in English. Secondary students enjoy participating in the abundance of communication activities which draw on their interests, experiences, And communicative needs. Topics: school activities, sport, travel, weather,social activities, entertainment, history, music, and many more. Check Points - recaps the functions, structures, and vocabulary developed in the unit. A strong carefully sequenced structural base is embedded in the dialogues, communication practice, reading and listening exercises so that students come to learn language as a means of communication rather than as a set of rules to be memorized. TURNING POINTS … a major addition to the list of innovative Addison-Wesley language titles that teachers depend o.